The findings from researchers at The Ohio State University and their colleagues from the Dark Energy Survey (DES) collaboration are based on data collected during the first year of the DES, which covers more than 1,300 square degrees of the sky or about the area of 6,000 full moons. DES uses the Dark Energy Camera mounted on the Blanco 4m telescope at the Cerro Tololo Inter-American Observatory high in the Chilean Andes. According to Klaus Honscheid, Ph.D., professor of physics and leader of the Ohio State DES group, OSC was critical to getting the research done in a timely manner. His computational specialists - Michael Troxel and Niall MacCrann, postdoctoral fellows - used an estimated 300,000 core hours on OSC's Ruby Cluster through a condo arrangement between OSC and Ohio State's Center of Cosmology and Astro-Particle Physics (CCAPP). The team took advantage of OSC's Anaconda environment for standard work, Anaconda, an open-source package of the Python and R programming languages for large-scale data processing, predictive analytics and scientific computing. The group then used its own software to evaluate the multi-dimensional parameter space using Markov Chain Monte Carlo techniques, which is used to generate fair samples from a probability. The team also ran validation code, or null tests, for object selection and fitting code to extract information about objects in the images obtained by simultaneously fitting the same object in all available exposures of the particular object. The bulk of the team's 4 million computational allocations are at the National Energy Research Scientific Computing Center (NERSC), a federal supercomputing facility in California. However, due to a backlog at NERSC, OSC's role became key. According to Honscheid, for the next analysis round the team is considering increasing the amount of work done through OSC. The total survey will last five years, he said, meaning the need for high performance computing will only increase. In order to collect the data, the team built an incredibly powerful camera for the Blanco 4m telescope. "We had to construct the most powerful instrument of its kind. It is sensitive enough to collect light from galaxies 8 billion light years away," said Honscheid. Key components of the 570 mega-pixel camera were built at Ohio State. Paradoxically, it is easier to measure the structure of the universe in the distant past than it is to measure it today. In the first 400,000 years after the Big Bang, the universe was filled with a glowing gas, the light from which survives to this day. This cosmic microwave background (CMB) radiation provides a snapshot of the universe at that early time. Since then, the gravity of dark matter has pulled mass together and made the universe clumpier. But dark energy has been fighting back, pushing matter apart. Using the CMB as a start, cosmologists can calculate precisely how this battle plays out over 14 billion years. "With the new results, we are able for the first time to see the current structure of the universe with a similar level of clarity as we can see its infancy. Dark energy is needed to explain how the infant universe evolved to what we observe now," said MacCrann, a major contributor to the analysis. DES scientists used two methods to measure dark matter. First, they created maps of galaxy positions as tracers; secondly, they precisely measured the shapes of 26 million galaxies to directly map the patterns of dark matter over billions of light years, using a technique called gravitational lensing. Ashley Ross of CCAPP, leader of the DES large-scale structure working group, said "For the first time we were able to perform these studies with data from the same experiment allowing us to obtain the most accurate results to date." To make these ultra-precise measurements, the DES team developed new ways to detect the tiny lensing distortions of galaxy images, an effect not even visible to the eye, enabling revolutionary advances in understanding these cosmic signals. In the process, they created the largest guide to spotting dark matter in the cosmos ever drawn (see image). The new dark matter map is 10 times the size of the one DES released in 2015 and will eventually be three times larger than it is now. A large scientific team achieved these results working in seven countries across three continents. "Successful collaboration at this scale represents many years of deep commitment, collective vision, and sustained effort," said Ami Choi, CCAPP postdoctoral fellow who worked on the galaxy shape measurements. Michael Troxel, CCAPP postdoctoral fellow and leader of the weak gravitational lensing analysis, added, "These results are based on unprecedented statistical power and detailed understanding of the telescope and potential biases in the analysis. Crucially, we performed a 'blind' analysis, in which we finalized all aspects of the analysis before we knew the results, thereby avoiding confirmation biases." 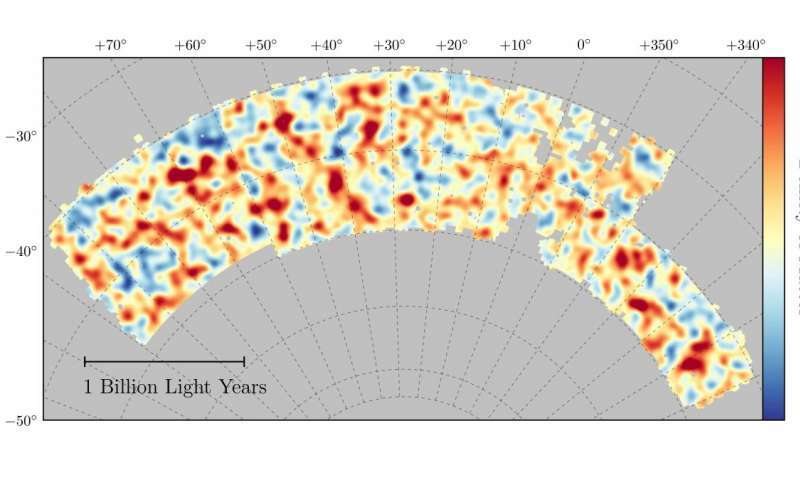 The DES measurements of the present universe agree with the results obtained by the Planck satellite that studied the cosmic microwave background radiation from a time when the universe was just 400,000 years old. "The moment we realized that our measurement matched the Planck result within 7% was thrilling for the entire collaboration," said Honscheid. "And this is just the beginning for DES with more data already observed. With one more observing season to go, we expect to ultimately use five times more data to learn more about the enigmatic dark sector of the universe." The new results from the Dark Energy Survey will be presented by Kavli fellow Elisabeth Krause at the TeV Particle Astrophysics Conference in Columbuson Aug. 9, and by CCAPP's Troxel at the International Symposium on Lepton Photon Interactions at High Energies in Guanzhou, China, on Aug. 10. The publications can be accessed on the Dark Energy Survey website.